The first thing you may want to do is check the status of Window Auto-Tuning. If it is turned off for instance, it is likely that it is not the case for the slow downs, but if it is set, it may very well be the culprit. Note: you don't need administrative privileges for running the command above, but you will need them for modifying the Window Auto-Tuning parameter. Tap on the Windows-key, type cmd.exe, hold down Shift and Ctrl keys, and hit enter. Run the command netsh interface tcp show global. 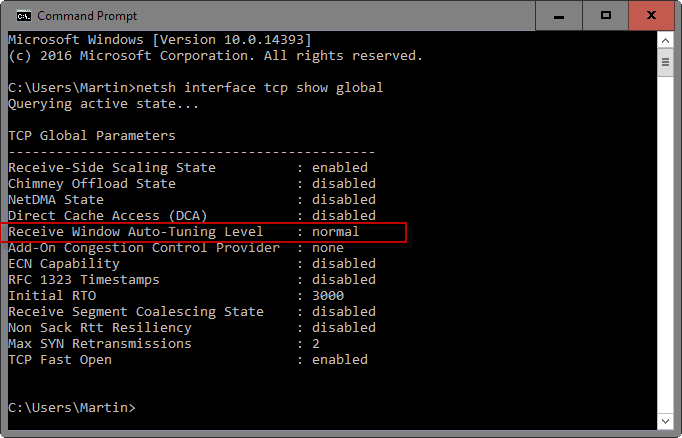 Locate the "Receive Window Auto-Tuning Level" value under TCP Global Parameters. If it is not set to disabled, it is being used by Windows to optimize TCP connections. You may want to disable the feature to run connection tests and see if it is the cause for the limited Internet speed that you are getting out of the connection. You get ok as verification that the value was set correctly. You may verify this by running netsh interface tcp show global again. Once disabled, start downloads just like before and monitor the speeds that you get. You may want to fire up a P2P client, Usenet program, FTP client or server program to find out if disabling Auto-Tuning Level did resolve the issue. Ok should be returned again to indicate that the new value was set correctly. It is recommended to check the global values again to make sure that is indeed the case.